Department of Management at I.T.S Ghaziabad organized Corporate Talk on the topic “Adaptation of Marketing Strategies in Changing Business Environment” on 21st February, 2019. Mr. Sanjay Gupta, CEO- PR Professionals and Founder-Director Edu Professionals shared his wealth of knowledge and understanding of Indian industry in the fields of Marketing, Sales Strategy, Advertising and Branding. He discussed in detail the different parameters of corporate world and gave insight of modern business work ethics in different companies according to their cultural variations. He described that launch of a product is no easy process it involves a true investment of time and energy, especially because you want the launch to be successful and well received by your audience. After all, an enormous amount of resources go into creating the product or service, so it deserves a launch to match. Mr. Gupta emphasized that you need to let people know why your feature or product was created, the solution it provides; and its innovative utility. He advised students that lesson for all marketers and communicator is to focus on their core and adapt cultural variations in business environment and preparing organization to face challenges. The speaker conveyed the nitty-gritty pertaining to cross cultural requirements. He explained the dangers of being formulaic and predictable in marketing strategies. Mr. Gupta proposed to bypass the predictable tactics by focusing on the goal, strategy and key audiences first. He also emphasized on increasing importance to gain online visibility across various digital platforms and how one can achieve optimal results in less span of time through product launch creative strategies. During his discussion, he shared his diverse experience with students. At the end of the corporate lecture, a special vote of thanks was given to him. 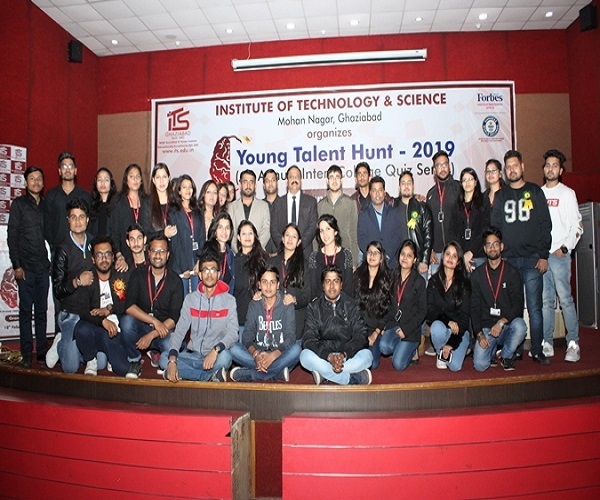 MARKETING CLUB- MARRECUS organised “SPIN THE WHEEL 2.0” on 21 February 2019 for PGDM batch 2018-20. The Major objective behind this event was to enhance theteam work and to showcase the talent in the creative end of marketing for the budding managers. The event had two round to compete. In ROUND 1, Total of 15 teams Participated. In this round each team was supposed to spin the wheel, the wheel was marked with five sections namely-numerical problems, dumb charades, riddles, war of brands and extempore. Questions were asked out of these five section presuming on whichever section wheel indicator had stopped. In ROUND 2, 5 teams were shortlisted from 1st round. Those teams were again have to spin the wheel. In this round there were three section (audio, audio-visual, pictorial), Question was asked based on these three sections only. These two Rounds were supported by few audience involvement, wherein Audience availed the opportunity to win prize by answering the questions. There were certain parameters for judgement including creativity, confidence, team work, content (delivery). Students portrayed great interest, enthusiasm and team spirit. Students have also shown their willingness for such future activities which may further enhance their learning and enrich their experience. The teams adjudged winners were Rahul Gupta and Rohit Kumar Singh, Shreshtha Ghosh and Devanshi Gupta for Ist and IInd positions respectively. Prize distribution ceremony was graced by honorable Area Chairperson (PGDM) Dr. V. N Bajpai. Wherein he motivated students by deliberating technicalities of Marketing and importance of out of the box thinking. The Occasion was also graced by Dr. Sanjeev Tandon. The entire activity was conducted under the mentorship of marketing club Co-Ordinator Dr.Garima Srivastav. Session attended on Behavioural Finance organized by Reliance Nippon Life Asset Management Ltd. 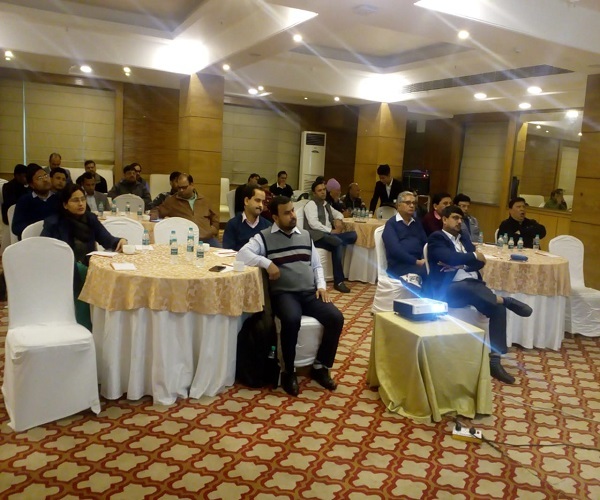 Faculty of Department of Management at I.T.S Ghaziabad, Dr. Shuchita Singh attended session on Behavioural Finance organized by Reliance Nippon Life Asset Management Ltd. on 20th February 2019. 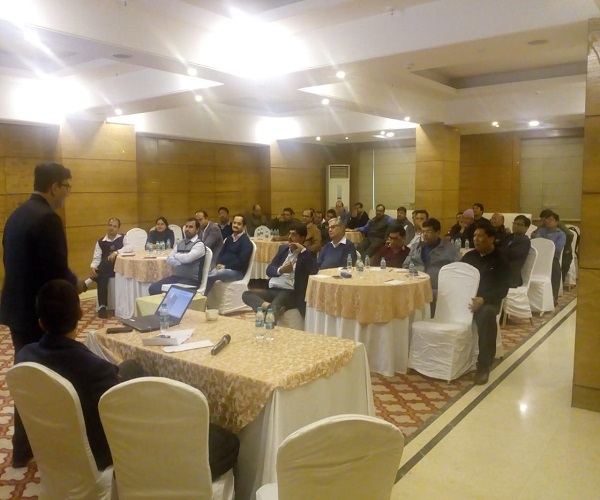 The trainer of the program was Mr. Nitin Raj Srivastava, expert in Behaioural Trainings at Reliance Nippon Life Asset Management Ltd.
Mr. Saxena delivered excellent content on the concepts of Behavioural Finance, focusing of major Cognitive and Emotional Biases. He further discussed the major bubbles taken place in financial markets and reaction of market to some major economic events like Sub Prime Crisis and NBFC Crisis. Objective of the workshop was to equip Wealth Managers with the different thinking patterns of investors, which can not only enhance their selling skills but also help them to have a better Asset Management of their customers. The session was very contemporary and enriching. 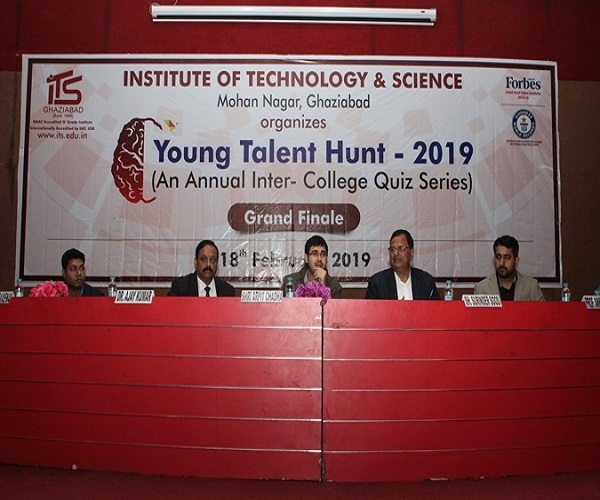 Department of Management at I.T.S Ghaziabad witnessed an exemplary success of Grand Finale Young Talent Hunt- 2019 - Inter college Quiz Series on 18thFebruary, 2019 with a huge participation of 292 students from 55 colleges of Delhi, Ghaziabad, Meerut, Hapur, Pilkhuwa, Babugarh, Sikandrabad, Dadri Bulandsher, Baghpat & nearby areas. Level 1 of this competition was initiated in the month of September, 2018 for the graduating students at the respective colleges/institutes and concluded with a GRAND FINALE at I.T.S, Mohan Nagar, Ghaziabad. 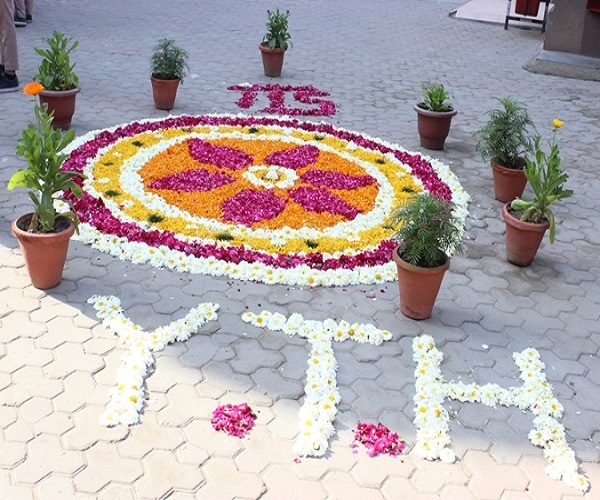 The mega show- GRAND FINALE- YTH-2019 kicked off in the morning of 18th February, 2019 with huge registration of 292 students, 14 teachers & parents from 55 participating colleges/institutes. The opening ceremony of Chanakaya Auditorium was the curtain raiser of this mega show. The event was formally inaugurated with lamp lighting ceremony in auspicious presence of Shri Arpit Chadha, Vice Chairman – I.T.S The Education Group, Shri Surinder Sood – Director (PR), I.T.S The Education Group and Dr. Ajay Kumar - Director Management. Shri Surinder Sood, Director PR, I.T.S -The Education Group in his welcome address asked the students to plan their career in right way. He also interacted with the parents and discussed what support they should provide in guiding and shaping the career of their children. He pointed out that good career can only be build when right direction is suggested to the students at right time. Dr. Ajay Kumar, Director Management- I.T.S Mohan Nagar, addressed the participants, in his speech he highlighted that one should not feel de -motivated after losing a competition rather one should look forward for a positive aspect related to it. Dr. Nitin Saxena presented the overview of the event and sequence of the program. After the inaugural ceremony, three written elimination rounds were conducted. The Semi finals were conducted parallel for UP and Delhi Colleges. Quiz Master for two semi- final rounds and final round were Ms. Ashtha and Ms. Tulika. Participants also enjoyed Gaming Stalls and Nukkad Natak on “Voters Awareness” organized by MBA students and coordinated by Prof. Jyotsana Vaid. Prof. Yachna Malhotra and Prof. Shikha Arora conducted Employ ability skill session for the eliminated students from round one. Dr. Lalit Sharma & Dr. Garima Srivastava with admission team coordinated the campus round of the students. The Participants energized 06 finalist participants with a loud applause for their out of the box skills and show cased the event as a great mix of talent, energy and enthusiasm. The Champion’s trophy with cash prize of Rs. 10000 was lifted by Rishabh Gautam from DAV PG COLLEGE BULANDSHER, RISHU SHARMA from RG PG COLLEGE MEERUT bagged second position with a prize money of Rs.7500 and CHANDAN VAISH KARMA from JSPG COLLEGE, SIKANDRABAD grabbed third prize with cash prize of Rs.5000. The next 03 consolation cash prizes of Rs.1000 were won by VINIT TEVATHIA from Laxmi Chand Patvari COLLEGE, BAGHPAT, AMANDEEP from GHMIT, KARKARDOMA DELHI, GURPREET KAUR from DIRD, DELHI. Event was very well coordinated and was a huge success. 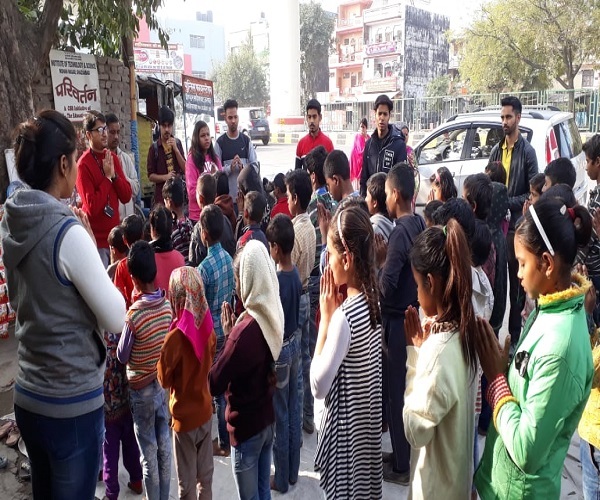 In keeping with the spirit of the above quote by the renowned tennis player, Parivartan decided to focus on physical activity for the children. Besides, this being the monthly Game Day, there was the added attraction of game play with attractive prizes on offer. The day started with one minute' silence after prayer, in the memory of the forty Indian soldiers whose lives were brutally cut short at Pulwama last week. The first segment warmed things up with a P.T. session led by Sunil and Jyoti. They first explained the meaning and importance of P.T. or Physical Training. Helped by the other volunteers, they taught the children about the basic stretches for different parts of the body. Needless to say, the learners joined in with the expected zest and vigour. Coming to the more fun part of the day’s activity, the volunteers had arranged for two kinds of games. In one, the kids had to do the opposite of what they were instructed. For example, when asked to sit, they had to stand up. Those who failed to do so would be eliminated. This was a throwback to the stress on sports as a lesson on attentiveness and quick response. In the other game, Sunil played music on a speaker. The participants had to dance with the music, turning into statues as soon as the music stopped. Those who could not would be out of the game. Four winners were selected from each game. Each of them received a badminton racket set as a prize. 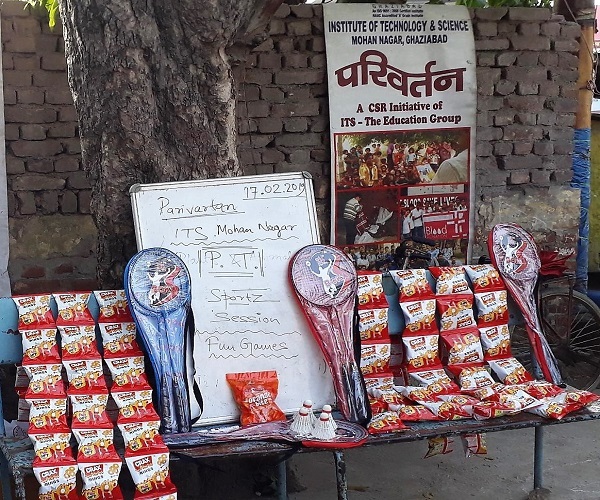 A revision of the day’s learning was also carried out, with those answering correctly receiving a ‘Parle Kaccha Mango Bite’ toffee each. The day winded down with the distribution of packets of ‘Crax Rings’ and ‘Parle Orange Bite’ toffees among the children. Department of Management studies at I.T.S, Mohan Nagar Campus organized third edition of Business summit with a focal theme “Digital Transformation and Business Evolution” on Saturday, 16th February, 2019. This summit was one of the leading platform where business, policy-makers, civil society and academia came together to discuss the current trends and challenges in the Indian business landscape. Business Summit witnessed the presence of prominent speakers across the industries on the day. Major General Dilawar Singh, Director General, Nehru Yuva Kendra Sangathan Ministry of Youth Affairs and Sports Government of India addressed the gathering as the Chief Guest and Shri Raghavender G.R. IAS, Joint Secretary Department of Justice Ministry of Law & Justice Government of India as the Guest of Honor . Other renowned experts for the business summit were, Mr. Prashant Sharma, Senior Vice President ,Kotak Securities, Mr. Vinayak Lal , Senior GM, DS Group, Mr. Avinash Srivastava , General Manager, DLF, Ms. Latika Wadhwa , CEO (Founder), Mompreneur Circle, Mr. Jyoti Das Business , Head Asia Pacific, Calvin Klein, Mr. Akash Sharma, VP – Finance ,Bajaj Hindustan Ltd., Mr. Narendra Kumbhat, Founder Mentor, Virtual CFO Partners Pvt Ltd.,Mr. Bharat Bhushan , Head (IT& Social Media), Doordarshan, Mr. Pramod Joshi , CEO, Winning Mantra, Dr. Shobha Kulsrestha, Corporate Trainer, Mr. Amit Kumar Tanwar, AVP – Business Banking Group, IndusInd Bank, Ms. Manavika Sharma, AVP –HR, BIS Research, Ms. Margaret Chari, Organization and position : Sports and Recreatio, Commission, Business, Development and Marketing Manager from Zimbabwe, Ms. Daniela Tello Rioja, CEO and Co-Founder Tinto Libre. Social entrepreneurship on economic vulnerability reduction from Colombia, Mr. Abdibeshir Said , Lecturer and College registrar head at Haramaya University from Ethiopia. 82 foreign delegates from 35 countries (Ethopia, Jimbabe, Afganistan, Argentina, Kenia, Ghana, Nigeria, Sri Lanka and Columbia etc ) and 60 delegates from corporate & academia registered themselves for Summit. Foreign Delegates & other delegates from Delhi/NCR showed huge enthusiasm by participating till the last session of the Summit. Inaugural session of Summit started with the opening remarks of Sh. Surinder Sood, Director (PR) , I.T.S – The Education Group. He emphasized on the role of digitization for upliftment of unorganized sector, expedition of corporate social responsibility activities of business . Dr. Anusha Agrawal, (Convenor) discussed an overview and detailed program of the Summit. Dr. Ajay Kumar, Director (Management) delivered welcome address. He discussed issues related with digital intelligence, digital innovations, company culture and virtual business system with the help of digitalization. Sh. Arpit Chadha, Vice Chairman, I.T.S - The Education Group addressed all representatives from industry, academia, government and educational institutions from India and abroad. He highlighted achievements of the Government plan and programs initiated by Hon’ble Prime minister and role of digitalization in effective utilization of such programs. Guest of Honor Sh. Raghvendra G.R. (IAS) addressed role of digitalization in globalized economy, copyright treaty, encryption device scheme, new disruptive technology, data mining techniques and financial inclusion in the light of digitalization. Chief Guest Major General Dilawar Singh stressed on evolving new business modules, creation of long term strategy with short term project, hybrid model for adopting changes, aggregation vs segregation and inspirational leadership. Finally he energized the audience with the slogan “Nation First and Character Must” and “Jai Hind”. Mr. Vinayak Lal , Senior GM, DS Group was the moderator of the session through out the session he enhanced the spontaneity of the session. Mr. Bharat Bhushan, Head (IT& Social Media), Doordarshan addressed issues based on role of social media in marketing, artificial intelligence and virtual media and how rapidly data getting transmitted on regular basis on the world wide web. Mr. Jyoti and Ms. Margarate Chari elaborated how to create a desire for a product, relevance of E- commerce. Mr. Avinash Srivastava focused on augmented reality and virtual reality and prediction of customer need. He focused upon disruption drivers in form of market dynamics, geopolitical disequilibrium & environmental concerns. Mr. Narendra Kumbhat, Founder Mentor, Virtual CFO Partners Pvt Ltd was the moderator of the session and thus made it ensure that it provides meaningful takeaways for the audience. Mr. Amit Kumar Tanwar, AVP – Business Banking Group, IndusInd Bank expressed their views on the theme during panel discussion. He specifically pointed out development in last 10-15 years indicating scope of numerous opportunities & innovation in India. He spoke about digital revolution and innovations in Indian Banking Sector. Mr. Prashant Sharma Senior Vice President ,Kotak Securities explained customer online query related with money transfer, check balance, money investment and loans. He emphasized upon customer relationship in era of Digitization & Artificial Intelligence. Ms. Daniela Tello Rioja, CEO and Co-Founder Tinto Libre from Columbia discussed banking sector innovations with the help of digitalization and enhancing banking efficiency in terms of sanctioning online and offline loans to the customer in context with the country Columbia. 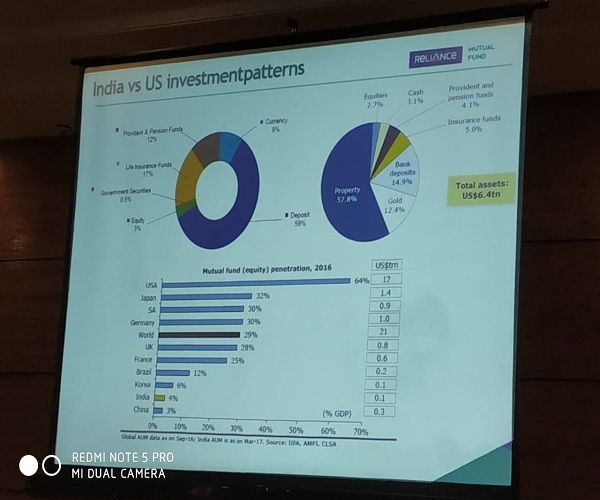 Mr. Akash Sharma , VP – Finance ,Bajaj Hindustan Ltd. elaborated various trends in Financial Services Sector and the factors to keep in mind before investing money. Dr. Shobha Kulsrestha, Corporate Trainer was the moderator of the session and elaborated process of promotions and increments with effective digital system. Mr. Abdibeshir Said, Registrar, Haramaya University (Ethiopia) expressed their views on contemporary HR issues and role of digitalization in Human Development in Ethiopia. He emphasized upon technology updation of HR fraternity in order to imagine the future, design the future & align the future with the present. Ms. Malvika Sharma, AVP –HR, BIS Research addressed about hiring talent, on boarding process and rewards and recognition process with the help of digitalization. She spoke about digital revolution, virtual organization & challenges related with them. He said that the decision making will be data-driven along with inner gut & feeling in time ahead and intellectual work will be done by machines. Mr. Pramod Joshi, CEO Winning Mantra attempted issues related with interview, employee data and HR planning in contemporary age with rapid digitalization. Ultimately entire sessions were highly informative, productive and sensitizing to students, academicians and business professionals. He advised everyone to rethink about the concept of leaders & the leadership in changing times. I.T.S Mohan Nagar has a rich tradition to organize such events based on contemporary social, business, academic, industrial and other developmental issues in addition to its regular academic, professional and research based activities with its prime objectives of creating a sense of awareness among audiance and ensuring sincere efforts of the institution for socio economic development and thus acting as a catalyst for nation building. Business Summit- 2019 is also a part of the same endeavor to strengthen Industry- Institution- Interface to facilitate competitive and time demanding professional education and to produce business leaders and executives to cater demand of industry, business and society. 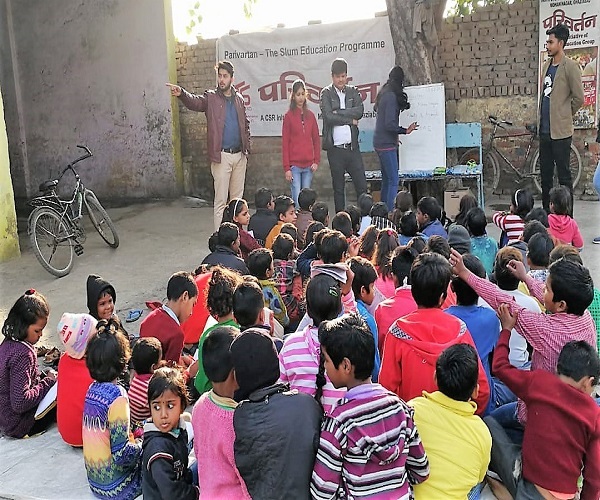 ‘Parivartan’ – The Slum Education Programme at Department of Management of Institute of Technology & Science, Mohan Nagar, Ghaziabad organized activity based on theme of Spring. The nip that was in the air is slowly vanishing, the sun is shining brighter and winter is finally in retreat. It was also a day to remind the children about the significance of the Goddess of Learning - Ma Saraswati. Prof. Lokesh Upreti laid down the plan for the day by announcing the proposed distribution of copies, sharpeners and erasers among the learners. Literally hundreds of copies, sharpeners and erasers were handed out to the children. Prof. Upreti also initated the day’s sessions by apprising the children about the importance of spring in the annual calendar. He also brought in the context of Basant Panchami and Saraswati Puja, which are celebrated on this date. Teacher-in-chief Shiksha than took the baton to discuss the various seasons and their characteristic features. She continued to describe how Basant Panchami is celebrated through yellow attire, flying of kites and of course, the observance of Saraswati Puja. Rishita also came over to help out with this session. In the next part of the day’s classes, Nagesh educated the little ones about the necessity of libraries. Children were both surprised and excited to know about the Govt. library (Ch. Charan Singh Library) at Meerut More, which offers free membership. Many of them noted down the address with great enthusiasm and promised to visit it soon with their family members. 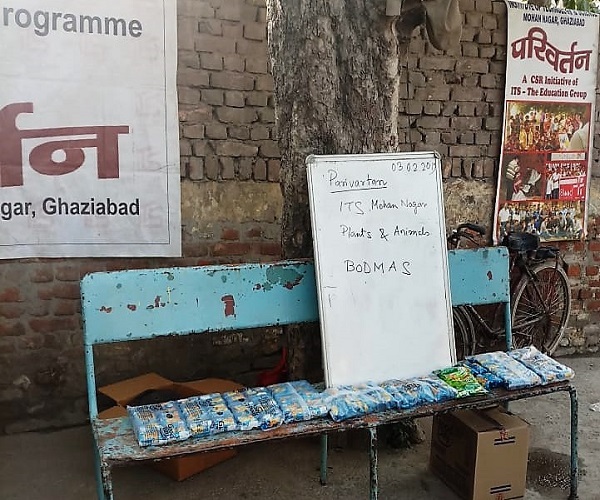 As the day winded down, books on multiplication tables and names of body parts were distributed among the children, along with the customary ‘Britannia Good Day’ biscuits and ‘Kismi Bite’ toffees. Prof. Lokesh Upreti guided the volunteers in the conduct of the programme as the faculty coordinator of CSR Club - Parivartan. 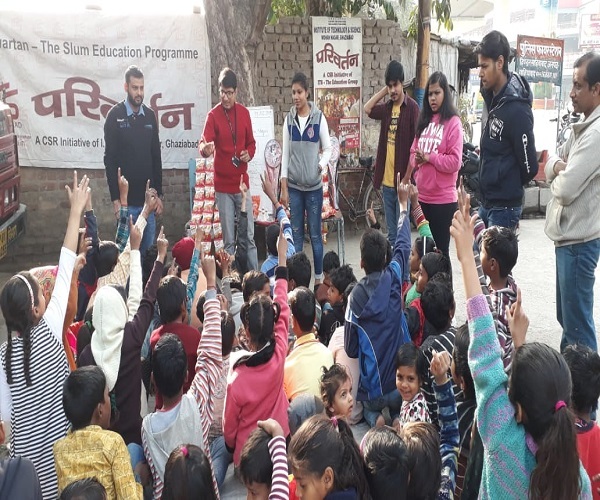 We at Parivartan would like to specially note and acknowledge the tremendous efforts put in by volunteers of Parivartan for their exceptional contribution and donation of copies, books and stationary materials among the children out of their own sense of duty and affection for the learners. 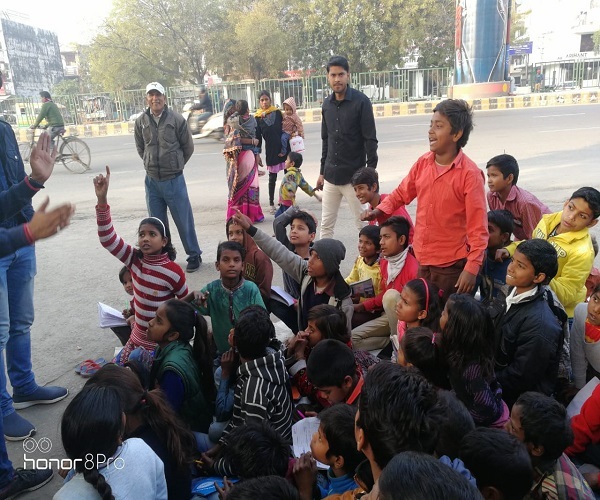 Parivartan is obviously not a learning experience only for the children, it is truly heartening to see this kind of thinking and effort. Finance Club “Finvest” at Department of Management at I.T.S Ghaziabad organized “Union Budget Analysis 2019” for PGDM and MBA students on 7thFebruary, 2019. The objective was to provide a platform to the students for analyzing and understanding the various dimensions to a budget and its implications for an economy. Eight students from MBA and five from PGDM participated in the event and gave presentations basis the various sectors such as taxation, agriculture, defense, healthcare, telecom, railways etc. They highlighted the major schemes, allocation of funds and various amendments made by the central government for the upcoming financial year. The jury for the event consisted of Dr. Anusha Agarwal, Dr. Shuchita Singh and Dr. Namita Dixit. After wonderful presentations by the students, the best presenter awards were given to Aakash Mishra and Sudhanshu Dixit from MBA first year and Indranil Mondal from PGDM first year by honorable Director (Management), Prof. (Dr.) Ajay Kumar who also motivated and encouraged students to participate in such events so as to develop a holistic personality. 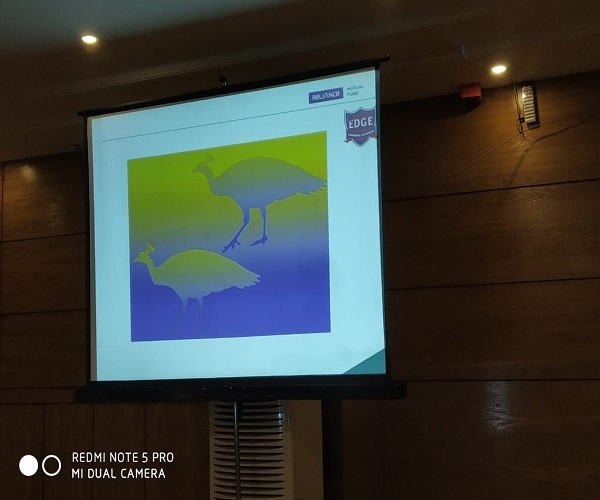 The event was successfully conducted by the finance club members namely, Asif Sami, Yogesh Bisht, Simmi Sharma, Rajat Kansal, Bhavpreet, Indranil Mondal, Shubham Kalla, Navneet, Surbhi, Divya, Rahul, Shweta, Vidhi Bansal, Mayank Dwivedi, Harshi Singhal, Nidhi Mishra, Kirti Goel and MeghaKandpal under the guidance and mentorship of their club coordinator Prof. Neetu Purohit. Department of Management at I.T.S Ghaziabad organized a special session of Shri Sanjay Kumar on Ethics and Goal Achievement” for it's PG students on 6th February, 2019. Shri Sanjay Kumar is a social leader, reformer deeply grounded in spirituality, continuing to transform lives with an aim to create a society free from crime, violence, addiction and social discrimination through several humanitarian projects and peace building initiatives of the Art of Living. He is associated with the Art of living since past 20 years and have spearheaded various projects and initiatives of the foundation. In his address to students, he highlighted the importance of being a good human as an essence of becoming a good Manager. He said that setting goals is essential for driving performance, but goals can also lead to unethical behavior. He shared his experiences and motivated students on how to avoid the dangers while undertaking initiatives that promote both performance and an ethical culture. It was great learning for the participants. 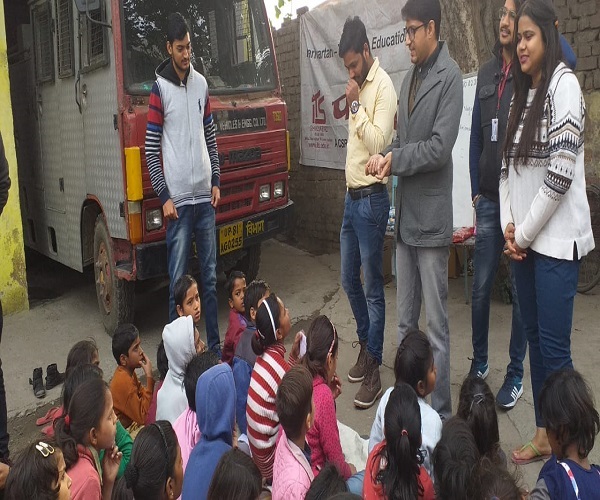 ‘Parivartan’ – The Slum Education Programme of Department of Management at Institute of Technology & Science, Mohan Nagar, Ghaziabad organized a full class returned amidst the bright and comforting sunshine, we decided to go back to the basics with sessions on flora and fauna, and the BODMAS rule of Maths. Atul flagged off the day with the discussion on plants and animals. Jhalak joined him as they started explaining the different features of each. They went on to discuss the various parts of plants and trees like branches, stem or trunk, roots, leaves, etc. The exercise was rounded off with the classification of organisms according to diet into herbivores, carnivores and omnivores. Several examples were provided to illustrate each type. The children joined in with gusto to respond to each and every topic of the session. The next session was more or less a Jhalak show as she went about explaining the intricacies of the well known BODMAS rule. The learners were of course up to the challenge as they vigorously contributed to the interaction, though they needed clarifications on a couple of items. Their understanding was then tested via a few examples conjured up by Jhalak. A quiz was also held to test the knowledge acquired in the earlier session, with those who answered correctly receiving a pack of biscuits each. The day came to an end with the distribution of ‘Britannia Good Day’ biscuits and ‘Parle Kachcha Aam’ toffees among the children. Dr. Indraneel Mandal accompanied and motivated the student volunteers. 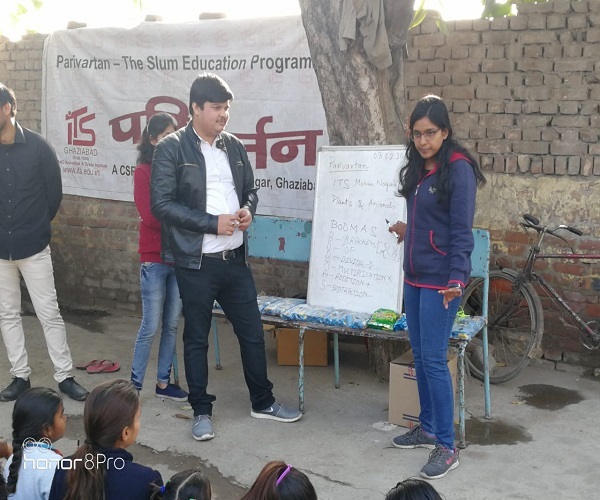 Prof. Lokesh Upreti planned the activity and guided the volunteers in the conduct of the programme, as the faculty coordinator of CSR Club - Parivartan.